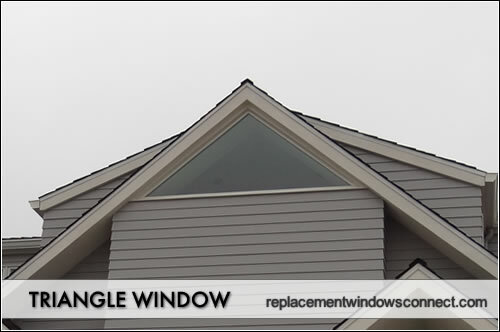 Triangle windows are specialty windows that can add a unique element to a home’s design. They can are often custom made and come in a variety of frames and options. Triangle windows are three sided and can be right angles, equilaterals or all three different lengths. The right angled shape is the most common and are often used in combination with other geometric shapes and can be found at the top of walls with steeper pitched roofs. A “V” shaped roof (which are common in climates that get a lot of rain and snow) with a steep pitch will use these shapes in the upper portion of the wall because they fit well with the design. They are available in vinyl or uPVC, which are the least expensive option or in a fiberglass or wood, which will carry a higher price tag. The biggest issues affecting price include the size, frame material and whether a custom installation needs to be done. Smaller sized options that can be inserted or swapped out for the existing window will be at the lower end of the cost spectrum. Larger wood framed options that require custom resizing of the existing opening by contractors will tend to be at the top end of the price scale. Triangles are very intriguing and angular, adding visual interest to a wall due to their somewhat rare usage. The use of two right angled triangle windows that sit back to back is a popular design that frames the wall and is visually striking. Another popular option is a single equilateral at the top that provides lots of light for an attic or converted room. Because they can stretch out at an angle on a V shaped wall, they are one of the best ways to maximize natural light for an add on bedroom, play room or sewing room. Triangle frames are unique in the fact that they are one of the only window types that do not open. The design simply does not allow for it, unlike other geometric shapes such as hexagon or octagon windows, which can swing completely open. The biggest drawback here is that you cannot get any natural air flow or ventilation into a room. window replacement estimate (3 is ideal), which allows a homeowner to compare the bids and make sure that the overall price is competitive and to see a price breakdown for the project.